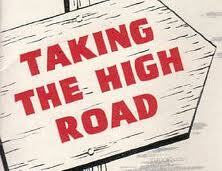 Family Volley: Tired of the "High Road"
Tired of the "High Road"
For example. If my husband comes home and says something that might feel a little insensitive, instead of holding it against him for a week, or saying something hurtful back to him, I think..."he has had a long week, he didn't mean it that way, he is tired, he has a lot on his mind, he loves me and would never hurt me on purpose...etc." You know... the high road. I believe in the high road. I know it is a Christ like way to be. I hope that people will take the high road with me because I am sure I say and do things that could be interpreted different than they are meant. I never mean to offend. Besides, who am I to judge. I have no place. The high road helps me avoid judging, avoid holding grudges, and gives others the benefit of the doubt. All good things. It takes energy and effort to hold grudges. There are better places I can put my energy and effort. My husband and I are trying to teach our kids to take the high road. Especially with one another. Here's the thing. I believe in the high road, but, ...sometimes I get tired of it. Really tired of it. Does that sound bad? Last week my feelings were hurt by someone. Someone I am (or at least used to be) very close to. No, I am not talking about my husband. :) I will spare you the details, not necessary. My feelings were hurt so bad, it would have hurt less if they would have just punched me in the face. I spent all day trying to take the "high road." I thought about their situation, what they were going through, tried to be sympathetic and understanding. I kept trying to put myself in their shoes. BUT... Underneath it all, I wanted to call them, tell them where to go and how to get there. I wanted to tell them that if they wanted to have a relationship then things had to change. I wanted them to know that I would not just be sitting around to welcome them, once they got things straightened out. I actually wanted to get on a plane and tell them those things face to face. I couldn't tell which was worse, the hurt I felt, or the anger I felt. I was tired of "rising above it." I wanted to throw the high road right out the window. Surely for all the times I have taken the high road, I was entitled to get mouthy at least once, right? There was internal turmoil between what I knew was right, and what I wanted to do. Do you ever feel that way? Over the last few days I have tried to forgive and move past the incident. I can't imagine what this person is dealing with in their life right now. I know they are doing the best they know how. I know (or at least am hoping) that they wouldn't hurt me on purpose. My husband and I were talking about the situation. He reminded me of a phrase we heard over and over during General Conference a few weeks ago. At first I fought the saying in my mind. "Yes it does", I thought. Charity fails. I feel like I have been showing charity toward this person and the situation for a looooong time, and nothing has changed. I don't see charity changing anything any time soon either. Then, like a breath of fresh air, It dawned on me. Showing Charity to other people will never fail. Things might not change, relationships might not get better now, or during this life, BUT regardless... there will come a day when I am judged. I will be judged for my actions and my thoughts. It is then that "Charity will never faileth". It is then that I will be grateful for the times I took the high road, and despair over the times when I didn't. It is then that the Lord will show mercy for all of my weaknesses and my shortcomings. When I am judged, the times when I have shown charity will never have failed me. I was reminded that I don't get to choose when to forgive or rise above, or take the high road. I am required to take the high road, always. My salvation depends on it. A humbling reminder that I shouldn't ever get tired of the high road, because the high road is always the right road. Are you ever torn between what you know is right and what you want to do? Beautiful! Perfect! And exactly what I needed to hear. Thank you! I'm very much the same way. My husband and I have never had a big blow-up fight--outside of our honeymoon--in 10 years. I think it's for this very reason. I know he's tired, or just not thinking, but sometimes things he says really hurt. But rather than say something and cause a fight, I think about it for a while. I think about where he's coming from and what he was probably thinking. I do NOT believe in the "never go to bed mad" rule. I think that's stupid. I go to bed mad a lot...and wake up totally fine. And I didn't have to cause a fight by bringing up some obscure, inane comment he made when he was tired. The high road does get tiring sometimes. Great reminder. Thanks. I've learned it takes just as much of the Atonement to forgive someone as it does to be forgiven. There's something about laying the problem at the feet of the Savior that can and will heal us. It may take some time, but it will happen, and you will feel true charity for this person, whether things change or not. Best wishes to you. Every morning when I wake up. I want to keep sleeping, but I need to get up and look after my children. The compute/iPad/phone/tv won't do nearly as good a job as I can. When I read the beginning of this post, I felt like I was reading a narrative of my life. I'm a pushover/frequent traveler of the high road, and I was recently hurt by a friend. I wrestled with confronting her about it just like you did... but I took a different road this time. I won't say I took the low road because I wasn't malicious or out for blood... but it definitely wasn't the high road. Since this happened, I've been trying to figure out my feelings about it. Initially, I was proud of myself - because I believe the difference between taking the high road and being a pushover is having the ability to stand up for yourself if you need to occasionally. Our free will allows "taking the high road" to really mean something when we do it. If we take that road because we were afraid of an argument or confrontation, we are not truly doing it because of our morals or good character. I did not veer from the high road because it was easier. In fact, it was MUCH harder than staying quiet would have been for me. As I said, I tend to avoid confrontation. However, I believe that this argument will allow our friendship to grow. At least, that's what I'm hoping. How great this was to read! I am a person that usually takes the high road. Yes it hurts but I try to be sympathetic about certain situation and go from there. Yes it hurts, but most of the time that person (my husband) will come back and apologize. Men are grumpy and mean when they are tired!!! !